Last week, Bushiroad announced they will be dramatically increasing the size of their annual Bushiroad Spring Fest, which includes three separate tournaments: the Cardfight!! Vanguard Team League, Future Card Buddyfight Buddy Challenge, and the Weiss Schwarz Neo-Showdown. They’re adding tons of additional regional qualifiers for the 2016 tournaments: 23 locations versus last year’s 8. 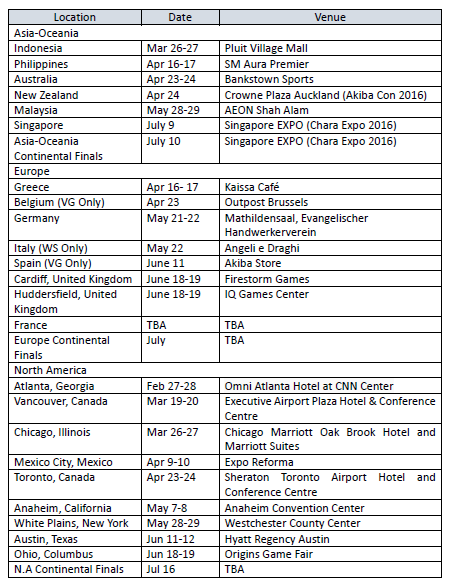 Events will run from March to July across North America, Europe, and Asia-Oceania (Asia-Pacific). This event is separate from the yearly World Championships for the same three games, which just recently finished up qualifiers for the January 9th World Championship tournament in Tokyo. Cardfight!! Vanguard is releasing the 2015 G Fighters Collection on January 8th. It will include 50 cards and new G units for 24 clans. The Asia-Oceania Finals will be held at the Singapore EXPO on July 10th, with regional qualifiers in Indonesia, the Philippines, Australia, New Zealand, and Malaysia. The final coincides with the annual C3 CharaExpo, making for a pretty epic event. The Europe Continental Finals will be held sometime in July at a yet-undecided location, with the regional events occurring in Greece, Belgium, Germany, Italy, Spain, Cardiff and Huddersfield in the UK, and France. The North American Finals will occur on July 16th at a yet undisclosed location, with lead-up qualifiers across the United States and Canada. If you live in the area, you’re eligible for that area’s regionals; for example, players in North America can attend any North American event, but cannot participate in European or Asia-Oceania events. Before the tournaments start, Bushiroad is hosting a PR Coupon Campaign from February 1 to April 3. All players need to do is participate in an official shop tournament during this time, and they’ll receive a special PR coupon for the Festival. This can be used to snag exclusive cards after participating in one of the three Spring Fest tournaments – this is in addition to the festival’s primary prizes. Online players can also use the coupon to pick up a new PR card. During the event, players are allowed to redeem up to 4 coupons. At the tournament itself, players are playing for bragging rights as well as a limited edition pin, which will go to the top 8 teams, and a special certificate, which will go to the top 4 teams. Participants will also receive a free PR card, and may also earn a new deck case. The card and case will be dependent on the tournament participated in. Although the focus of the festival is on the three tournaments, there’s plenty to do for anyone who wants to stop by. Bushiroad is hosting free fight events for all three TCGs, and some locations will also be hosting a Junior Challenge for kids. The regionals and final tournaments are free, although some locations may require some type of entrance fee depending on the venue. Tournament formats will vary by game and region. All three TCGs will use a double elimination Modified Swiss in Asia-Oceania, and Swiss in Europe. Thing switch up in North America, with Cardfight!! Vanguard using Modified Swiss, and Weiss Schwarz and Future Card Buddyfight using Swiss. The Cardfight!! Vanguard Team League will be teams of 3 people playing based on the Clan Fight deck regulations. Weiss Schwarz Neo-Showdown participants will be playing the Neo-Standard deck, and Future Card Buddyfight Buddy Challenge will allow Sideboards. Bushiroad Spring Fest, including regionals, finals, and the free fights, will only use English cards, and players are allowed to use anything from the new expansions for each respective TCG. Once the tournaments whittle down the top 8, all three games switch to single elimination. Bushiroad noted in the announcement that there will be more info coming out sometime in December, so stay tuned for updates to locations, availability of events for kids, and more!